Arsenal’s indifferent away form continued with a 2-1 defeat to Queens Park Rangers. Their opponents might be embroiled in a relegation battle but there was an air of uncertainty whether Arsenal could extend their lead over Tottenham Hotspur with a victory. That’s because their record away has been patchy until recently – it became 7 wins, (2 draws) and 7 losses after this defeat – but while previous games against Sunderland, Liverpool, Everton have yielded wins, Arsenal have rode their luck somewhat. The decision to start Aaron Ramsey on the left against Everton raised a few eyebrows but that was emphatically swatted away by the start Arsenal made. However, at QPR, that moment never came. Just as Thomas Vermaelen was at fault for the two goals, Ramsey has been scapegoated – or rather the selection of him out wide, as symptomatic of Arsenal’s poor performance. The rationale was not incorrect although by deploying a player outside of his favoured position it always carries with it, a higher degree of uncertainty. Ramsey tended to drift inside and that clogged up the centre. But that in itself shouldn’t be a problem because put simply, Arsenal’s movement was below par. Indeed, the selection of Ramsey on the left as an auxiliary wide midfielder was meant to encourage greater fluidity and in particular, the rotation between him and his direct competitor in the centre, Tomas Rosicky. That may seem like an unnecessarily complication but possession sides are built on interchangeability and by drifting infield, it opens up space for another midfielder to take up his position. It should be the basics of football and in Spain, young players are trained this way as they are “taught to see the pitch as a field of eight boxes, all of which must be occupied.” Indeed, Cesc Fábregas hints at this “tactical anarchy” when he says “at Arsenal, I could move wherever I felt I could make the best contribution. Here [Barcelona], it’s completely different. Everyone has their own place and it’s important you stick to your position.” And certainly, this season, we’ve seen him frequently get into positions detriment to his team – at times, getting in the way of his team-mates – a sight all too familiar at Loftus Road whenever Ramsey drifted inside. 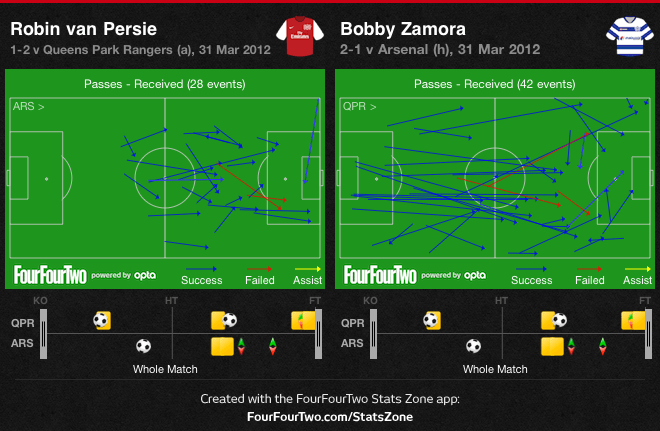 Fans shouldn’t direct their anger at just him though; Rosicky should have looked to take up his position on the left. 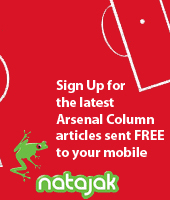 – Some argue the decision to start Aaron Ramsey on the left disrupted a winning formula. That’s not entirely true as although Arsenal fielded a more attacking line-up against Aston Villa, away from The Emirates, Wenger has often tried to incorporate another midfielder to retain a level of control. Indeed, on further inspection, it’s been the left-side which has been rotated in this run of wins with Yossi Benayoun initially starting there before Alex Oxlaide-Chamberlain was used against Newcastle. Ramsey was given his chance in the next game and was kept after a good team performance. Wenger would have wanted to recreate the first 30 minutes of that game where Arsenal completely outplayed Everton but perhaps it was wrong to draw too many conclusions from that win. Because when Everton did press Arsenal, they were unable to find any rhythm and surely enough, they fell into the same trap against QPR. Nevertheless, the way Arsenal did score was how Wenger would probably have envisaged – Ramsey coming inside, drawing attention away from the right where Walcott made a run, allowing Rosicky and van Persie to combine before freeing the winger. Unfortunately, it didn’t happen enough as Arsenal’s overall movement was very poor. Creativity suffered and, as shown by the graphic below, QPR funnelled their attacks and forced them to try and dribble their way – unsuccessfully – through the centre. The biggest test of Thomas Vermaelen’s character, after he allowed Adel Taarabt to get past him for the opener, was whether he would continue playing in the same manner. And sure enough, the next similar pass that was played to a QPR forward, he tried to nip in front and steal possession. Vermaelen’s game – as indeed Arsenal is – is built on his impetuousness, looking to regain possession quickly and compress the space in front. But it carries with it, it’s inherent risks and the downside of it was displayed twice for QPR’s goals as first, Vermaelen was turned by Taarabt before he slipped in the lead up to the second, after initially winning the ball. Both Vermaelen and Laurent Koscielny contribute heavily to Arsenal’s style due to their stealth-like ability to take possession of their opponents toes but while the latter has added calmness to his game, lengthy periods away from centre-back haven’t seen yet Vermaelen adjust. It’s not the first time he has made such errors that have led directly to goals and Vermaelen will have to prove that his reputation thus far, hasn’t been biased towards his character. Arsenal have long bemoaned costly individual errors and Vermaelen’s untimely slip means Arsenal have now conceded the most goals – 11 – from errors leading directly to goals than any other team. Both Vermaelen and Koscielny made five interceptions but Vermaelen’s sum up his zealousness as he won his high up the pitch. Alex Song’s importance was displayed once again as he attempted 109 passes in total but there is a feeling that he might be doing too much. Because, as well as acting as the shield in front, making 5/7 tackles, he’s often tasked with providing the through-balls for the forwards. It’s all part of Arsenal’s rotation in the centre but perhaps a degree of specialisation might allow them to be more efficient. At the moment, both Arteta and Song play a dual role but if one of them held, then Diakite’s goal might have been avoided. The pair have been superb this season but there are inefficiencies in the system, those of which have been particularly exposed away from home. If there’s one criticism of Robin van Persie’s game, it’s that his hold-up play leaves a lot to be desired. He lost the ball 8 times on Saturday through bad control or being dispossessed and generally failed to get into the game. He did have Arsenal’s best chance beyond the goal, threaded through by Song, displaying his superb movement but was well stopped by Paddy Kenny. By contrast, Bobby Zamora received the ball twice as much as QPR tried to play it to him early and he caused Arsenal plenty of trouble with his strength. Indeed, he tends to drift to his right and in the games he played for Fulham against Arsenal as well, he has got the better of Vermaelen. A common theme of QPR’s play was getting the ball down the channels, especially when Arsenal were disorganised. Kieran Gibbs was especially targeted and the winner came from his side. As shown by the take-ons below, QPR were not put under the same pressure down the left as they were on the right where Arsenal tend to slant. As a result, Gibbs wasn’t afforded the same protection and as thus, made to look inexperienced. He’s going to be a superb full-back in the future but at the moment, he’s not getting the help he requires.